Benicia’s Rev. Dr. Mary Susan Gast works on behalf of human rights in the Philippines. She alerted me to the shocking case of Jerome Aba. Jerome Aba, a human rights advocate from the Philippines, was invited by church groups to speak at a human rights conference in Washington, D.C. Upon arrival at at San Francisco International Airport last week, he was detained by US Customs & Border Protection (CBP), held for 28 hours, stripped naked in front of an industrial cooling fan, badgered and threatened, denied legal counsel, made to sign blank pieces of paper, and sent back to the Philippines. The mistreatment of Jerome Aba by Border Protection agents at SFO last week was horrific. Senator Kamala Harris serves on the Committee on Homeland Security, which has oversight of Border Protection. Please join in urging Senator Harris to investigate and hold Border Protection responsible. Follow the steps below. Pass this message along to others and urge them to make contact. Or you can phone Senator Harris’ office, identify yourself, give the name of the city where you live, and leave your message. 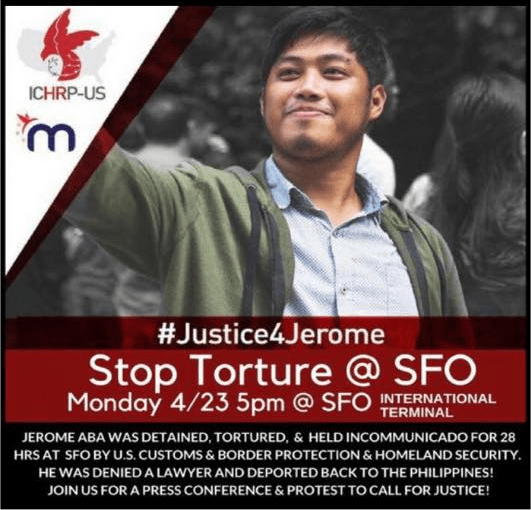 Just last week Jerome Succor Aba, a young peace advocate from the Philippines, was detained by Border Protection at SFO for 22 hours and subjected to grossly inhumane treatment. He was then sent back to the Philippines despite his valid visa and an invitation from religious and community organizations to take part in Ecumenical Advocacy Days in Washington, D.C. and a U.S. tour promoting peace in the Philippines. This is totally reprehensible. We look to you as our Senator and a member of the Committee on Homeland Security to find out why this happened and who is responsible, and hold them accountable. Thank you for your commitment to justice.